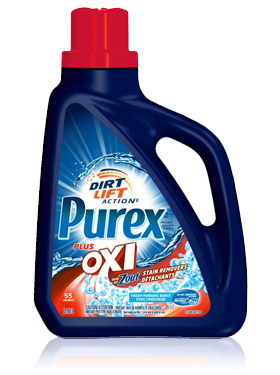 I have gotten the chance to try out a new product from Purex, It was the Purex+OXI Laundry detergent. i have to admit that i can be caught using the cheapest detergent i can get, sometimes with less then desirable results but i have to say i'm kinda impressed with this detergent. Results: I noticed that smell was a bit to much for me, i mean i love love love scents but it was a tad overwhelming. Other then that the blanket came out perfectly clean. After doing that test i had tried it on a load of clothes and i have to say im impressed, i didn't pre treat the clothes as i didn't feel like they needed to be but they all came out very clean! I would recommend this product and its a bonus to have OXI infused instead of having to buy separate. When i find something suitable to pre treat i will be adding pictures. If you don't like strong smells i would say maybe give it a try and see if it works for you. My clothes smell fresh, they are soft and most of all CLEAN :) This product works!! "purex provided me with a sample of purex plus Oxi detergent in exchange for a product review. however,all opinions expressed here are my own"
From August 19 - September 19, Purex will be providing one lucky winner with $500! For years, stains have caused you endless grief and frustration. No matter what product you use, nothing seems to give your family’s clothes the Bright, White & Clean look they deserve. But now that you’ve found Purex plus Oxi detergent, specially formulated to fight 101 of your toughest stains, you can finally bid adieu to stubborn stains for good. I have to watch out for scent that is too strong. When I am buy laundry products I look for ones that works for many different stains, including blood, grass. I like Tide cold water as it seems to work pretty well. I look for something that will get my kids clothes clean and that smells fresh.